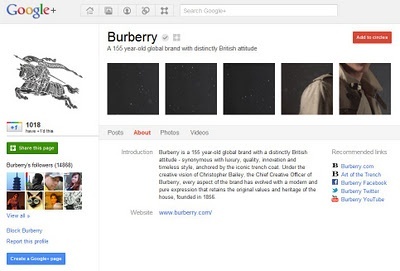 Google+ Pages can they crack the business profile challenge? A few months after Google+ first appeared for individuals, its Pages for businesses have arrived. Some brands, such as fashion house Burberry and car manufacturer Toyota, have dived straight in – whereas others are being more cautious and hanging back to see how well it works. It is easy to understand why the latter group may do this. Businesses which have taken the time to create and maintain accounts on Facebook, Twitter and LinkedIn could probably all list ways in which they'd like them to improve – so they want to know whether Google+ is worth diverting their existing social media resources. Some just don't want the extra hassle. The form of companies' online presences inhabits a wide spectrum. In 2011, some type of internet identity is taken for granted. Every brand has one (aside from, perhaps, that cluttered, dusty little shop in every town which sells a strange mix of hardware, fishing nets and discount toiletries. It's a fair bet they haven't bothered). In the old days of internet marketing, it was a simple case of having a company website – a reference point to establish official information and aid sales. People quickly realised that as well as providing a reassuring sense of legitimacy for consumers who already know your company exists, a website can also be an excellent magnet for digital passing trade. Hello, SEO. This more assertive approach has evolved to include interactivity. Business people who used to rely on their annual print advert in Yellow Pages now recognise that they are also likely to find an audience via Twitter, Facebook and LinkedIn, allowing them to converse and respond to fast-changing priorities. So, what does the latest business profile tool, Google+ Pages, bring to the table? The company's own description states: "Google+ Pages provides businesses, products, brands and organisations with a public identity and presence on Google+." Companies can present information about their services and share images, links and videos with Google+ users who follow them. This process seems to work smoothly, despite depending on circles of people switching to Google+ when Facebook is already so ingrained in their lives. But what about the 'public' bit? Most companies will wonder whether it also helps market the business outside the world of Google+. One of the more interesting developments is Direct Connect. This will mean that once a business has created a Google+ Page, searchers will be able to find it by typing '+company name' into Google, making a link to the page appear immediately via predictive search (see image, below). Clicking on this will lead directly to the page. It is currently being trialled using a small selection of brands. However, as many people still habitually rely on traditional search results pages, this might be a little unreliable. It also assumes the user already has an inclination towards finding the company, so mostly helps well-known brands. Indeed, there are several aspects of Google+ Pages that don't work quite the way you might expect. Large companies are likely to have several employees who need to be involved in maintaining online profiles – and yet Google+ Pages are managed from singular personal accounts. Competitions and promotions are prohibited. This seems to indicate that Google+ Pages is aimed at smaller, independent companies – but it doesn't really seem very well-devised for those, either. A friend of mine who runs his own business is a little confused. Having created the page through his personal Google+ profile, he had trouble finding it again – which, for a marketing tool, is not a good start. A week after its inception, it doesn't appear in Google's standard search results and it isn't possible to create a bespoke URL. These are disadvantages compared with Facebook, LinkedIn and Twitter. There is also no apparent connection to Google Places or Google Analytics – which is strange, as these two features are already extremely popular with businesses. Wouldn't it make sense for Google+ Pages to be designed to appeal to these existing customers? It seems unlikely that a historically inventive global giant such as Google could have overlooked such obvious options. This suggests that either there is a reason they haven't been included, or they plan to bring them in once they see how successful the initial take-up is. If it's the latter, Google is in danger of neglecting the notion that web users like quick results.